The young man--he was probably a college kid--came bouncing into our donut and coffee shop, Deputy Donut, like he was in love with the whole world. He came right up to the counter where I was pouring someone else's coffee and sat on a stool. "Sat" might not be quite the right word. He wriggled so much that he nearly slipped off. Catching me looking at him, he burst out with, "I have this great idea!" Uh-oh, I thought, great ideas often seemed to involve roping in people who did not necessarily want to be roped in . . .
"You're closed Thanksgiving, right?" he asked. His huge smile showed off very white teeth and a dimple in one cheek. I thought I knew where this was heading. "Yes, and Christmas and New Year's Day, too. "I was thinking that since you'll be closed, I could come in and deep-fry a turkey for me and my roommates." I knew it. "Deep-fry a turkey, here?" I hoped I managed to look as skeptical as I felt. "Sure, since you won't be using the place that day." I shook my head decisively. "Our insurance doesn't cover it." "I know you will," I said, "but deep-frying turkeys have caused lots of fires. Besides, you might get the turkey crispy on the outside, but inside, it will be a nest of salmonella." "Even if the oil is hot and you leave it in long enough?" "Yes, and there's another thing that makes it impossible. Our deep-fryers aren't big enough for a turkey." I stepped aside so he could see Tom lifting a basket of golden donuts out of one of the fryers. 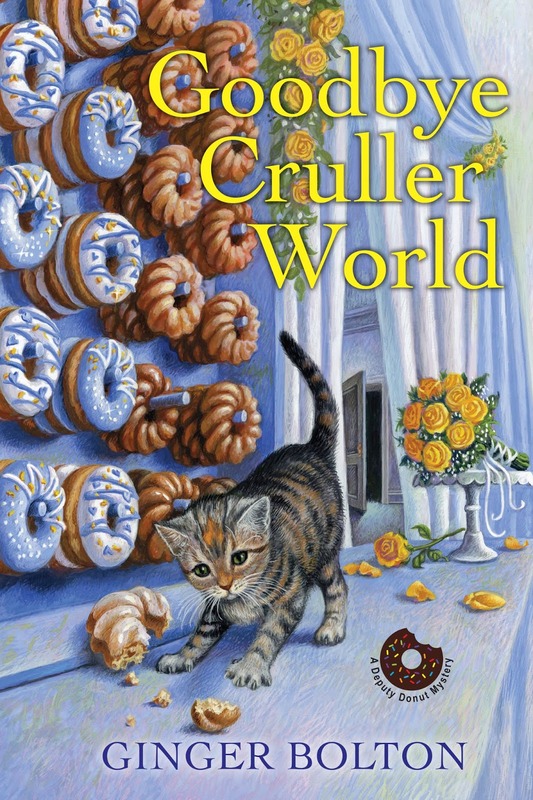 "We don't need really deep ones for frying donuts and other small treats." His shoulders sagged. "Oh. But I told the guys I'd cook the turkey." "Do you have an oven?" "You can cook the turkey on that if it's big enough and has a lid and a temperature gauge. You'll also need a meet thermometer to make sure it's cooked enough. It will be crispy, and tasty with a slightly smoky taste. Look it up online and you'll find the instructions." He bounced out as eagerly happy as he'd come in, and I was glad. I wasn't sure that anyone could deflate him for very long, but if anyone could, I didn't want it to be me. 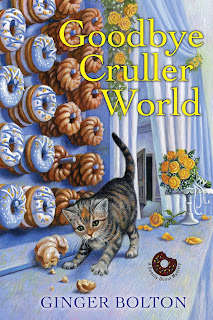 As Janet Bolin, Ginger wrote the Threadville Mysteries--Murder and Mayhem in a village of crafty shops. 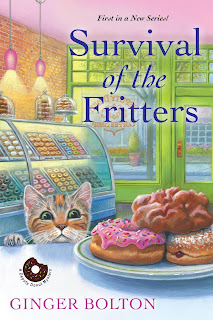 Would you like a copy of SURVIVAL OF THE FRITTERS or GOODBYE CRULLER WORLD (your choice)! In the comments below, tell us about any (mis-) adventures you've had with frying (doesn't have to be deep frying.) One winner will be chosen by random number. Yum, latkes. I have never managed to fry them without smoking up the house. My first job was in a restaurant and they let me try cooking one day. I was not paying attention and deep fried a towel with a bunch of fries. That one made me laugh out loud! What a funny story. And I love how you ended it with us wondering what happened next. Home made fries are the best! But maybe not charred. I like cast iron skillets. I've burned hands (not badly) but I've found other creative ways of breaking toes, not that one. Your poor friend! We have a cabinet above the hood. NOT very safe! Not frying, but I remember back in my childhood when the turkey came out of the oven, and my uncle began to carve it, and discovered it wasn't cooked! We had sides to eat until it was finished. Turkey for dessert, I guess. Oops. It's so hard to get it right. Meat thermometers help, and I like that little plastic thingie that pops up when the thigh is cooked enough. But really, turkeys done on the barbecue are the tastiest. A friend does them. I've succeeded, but I have to admit that it's easier to cook everything either inside or outside. And I've never made a complete Thanksgiving dinner outside. brrr. My brother-in-law tried to deep fry a Turkey one year and he had it all set up outside and away from the house. I don't think he realized that it would cook faster by deep frying it and it came out of the oil kind of well done. That was the last time we deep fried a turkey. Obviously, Emily has her doubts about cooking one enough in a deep fryer... But I agree, do it far from the house. I admit to having problems doing a lot of things . . .
My sister set off the smoke alarm in our apartment while frying eggs. At the time, our insurance agent had stopped by to discuss our renter's insurance policy. It was pretty funny. Never interrupt someone who is frying eggs!!! I tried forever to fry wilted lettuce salad and always ended up a mushy, green mess. That sounds about right . Turkey can be tricky . . .
Yum. I've never tried frying okra, but I can imagine it could be good. Well, not burnt, though. The coating often falls off, I've found. I'm not sure how to glue it on properly. Better too sensitive than not sensitive enough! We had a dog who was terrified of smoke detectors going off, poor thing. We had to take her away whenever we needed to test or change batteries. I have had a problem with the oil being too hot too. It just splattered everywhere. Ugh, what a mess. And those little hot splatters can hurt! A hot time, indeed. That was more drama than you really needed! I'm sorry for laughing... Sugar! Flour! My cooking disasters have been minor, but still . . .
My cousin was staying me while she started working & saving money. She had told me she didn't know how to cook, so we divided the chores. She was working mostly grave yard shift while I was on days. She had been given a turkey for the holiday & yes she did. I came home to Smokey home with dome windows open my kitchen still a mess. Broiled! Oh, no! That would do it. I agree. There are some funny stories here, and good storytellers, too. I love my cast-iron frying pans. And cornbread--yum. Maybe I should try putting the two together. Or not. Congratulations to nvictoria77. 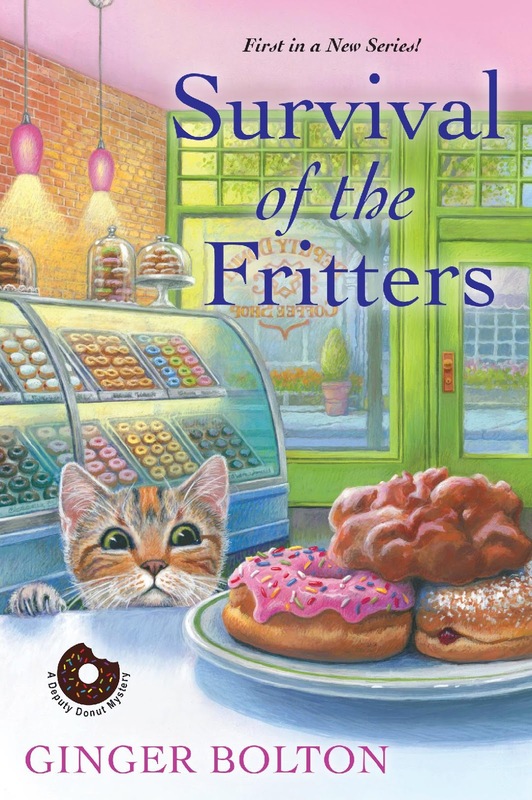 You are the winner of your choice of either SURVIVAL OF THE FRITTERS or GOODBYE CRULLER WORLD. I'll be in touch. Thank you to everyone who entertained us with your stories of cooking, and keep checking this blog for other #giveaways! Thank you so very much. I sent off an email with address.